Welcome to The Light Connection Inc. (TLC) and thank you for visiting our website. 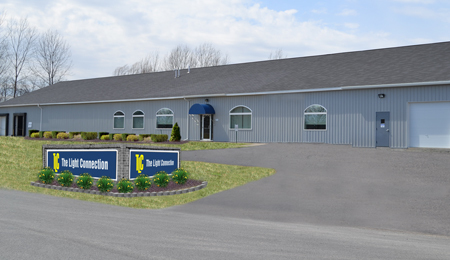 TLC is a privately held manufacturing facility offering cable and tubing for the Fiber Optic Industry. Located on a 14 acre site in upstate New York and with over 30 years of fiber optic cable industry experience, TLC is proud to be a registered ISO 9001:2008 company and offer OFNR, OFNP and LSZH products all of which are RoHS compliant. Being a channel partner with Corning Optical Fiber allows TLC to manufacture Simplex, Duplex, Distribution (indoor and indoor/outdoor), Ribbon, Dry Loose Tube indoor/outdoor, Breakout and Micro-distribution (data center) cables all constructed with Corning’s latest fiber offerings. Interlocking Aluminum Armoring is also available with most TLC cables. The Light Connection is also proud to offer other connectorization products such as Furcation Tubing, designed for standard termination processes, as well as Fan-out and Breakout kits. TLC’s commitment to customer service, short lead times, excellent stock positions, custom capabilities and keeping low minimum order quantities has allowed for ease of doing business thus enabling TLC to grow along with our customers. TLC regularly manufactures cables to special customer needs. Whether it is a unique jacket color or print, hybrid or composite cable or simply the jacketing of customer supplied fiber, the TLC engineering and production teams will ensure that the order is produced correctly and shipped when promised. Thank you again for your interest in The Light Connection Inc. For more information please contact us at sales@thelightconnection.com.